Vast Public Indifference: "A Bud From Plymouth's Mayflower"
The Little Compton graveyard is the final resting place of many important New Englanders, including Elizabeth Alden Pabodie, daughter of John Alden and Priscilla Mullins. When she died in 1717, Elizabeth's family erected an ordinary headstone similar to her husband's. 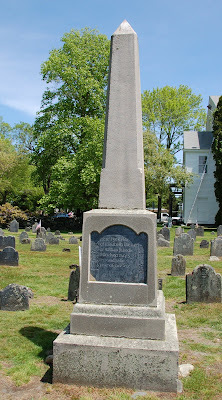 Over a century and a half later, after her great-great-great-great-grandson, Henry Wadsworth Longfellow, made her parents famous in "The Courtship of Miles Standish," Elizabeth got an impressive obelisk. In 1717, she was merely "the wife of William Pabodie." In 1882, she was "the first white woman born in New England." I'm becoming more interested in the ways in which gravestones were pressed into service in the creation of a distinctive New England identity in the 18th and 19th centuries — this is a great example of how commemoration changed over a century and a half. The Centuries Guard within this tomb.